Precious Metals: "The Canary in the Coal Mine"
The precious metals market has been on fire. Last week, gold hit a fresh all-time high and silver reached a new two-year high. In London, spot bullion hit a nominal record of $1,286 a troy ounce. The yellow metal has risen 17 percent since January. Gold is heading for its tenth consecutive annual gain, the longest winning streak since at least 1920. Silver rose to $21.03 a troy ounce, the highest in more than two years. The metal is closing in on the thirty-year peak of $21.24 an ounce set in March 2008. Adjusted for inflation, gold prices are a long way from their high above $2,300 an ounce set in 1980. Silver's old all-time high was $50 an ounce, set when the Hunt brothers tried to corner the market. It would have to rise to $135 to set a new inflation-adjusted high. The surge in precious metals has caught many producers with unfavorable hedge positions. Anglo Gold Ashanti, the world’s third-biggest gold miner, is spending $1.4 billion to wind down its hedge account. The forward sales of the Johannesburg-based miner are based at an average price of less than $450 an ounce, compared with current prices of more than $1,200. 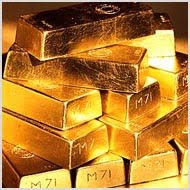 It was just in the early 1990s that you could buy gold for $270 per ounce. Several news outlets have tried to suggest that gold and silver are in a bubble. Last week, ABC News had a Nightline segment that had financial writer Ben Stein warning that gold investors are at risk of getting burnt as gold prices fall back to earth. One of the reasons for all the headlines about gold being in a bubble is because many financial journalists wants to be the one who called the top on gold. There is a risk of being too early at this game. I was searching on YouTube and I found a broadcast from October 2008 that people were saying gold at $760 was insanely overpriced and it was set for a huge drop. The long-term reason for the metals moving higher has everything to do with our ballooning national debt. We are simply spending ourselves into the poorhouse. Thomas Jefferson once said, "My reading of history convinces me that most bad government results from too much government." The smart investors realize that fiat currency is at risk of imploding, so they have bought precious metals to protect their buying power. The banking system is no friend of gold. Because banks don't loan out gold, they see it as a competitor to their form of money. Gold’s increase in price also represents inflation, which eats away at the value of currency. Several big banks have been trying to suppress the price of gold and silver by shorting these commodities. In the past few weeks, several of their big positions have come off, as the banks have suffered huge trading losses and are now waving the white flag. Former Federal Reserve chief Alan Greenspan was recently asked about gold, and he admitted it was the “ultimate means of payment.” He also confessed that the jump in gold prices could be “the canary in the coal mine to keep an eye on.” These are amazing words from the man who did the most to create history’s largest debt load. At some point, gold will reach a level that it begins to trigger a loss of confidence in the dollar and many other currencies. It may still take a few more years before we reach the panic phase, but when it comes, there will be little that the global financial system can do to stop the carnage. We are at such a late stage in the debt crisis, I don’t have any financial advice for what the average person can do to get ready. If gold continues to soar, all I can recommend is to place your trust in Jesus Christ. He is the One who has promised to deliver us from this doomed world.